A stunning led moonflower, ideal as a centre piece effect or even installation unit, the Nucleus led from American dj is sure to create the perfect atmosphere for your mobile rig/bar/pub or club! Using 6 3 watt Tri leds, the Nucleus projects 6 powerful beams of colour in red, green, blue, purple, yellow, cyan & white that that can be controlled via dmx, in-built programs, a seperate hand-held controller or even left sound-to-light. Thanks to it's unique shape, this fixture stands out from the average scanner or moonflower, and really makes a focal point of your lighting show. Considering purchasing the American DJ Nucleus LED High-energy TRI Color LED Centerpiece? Have questions? Ask people who've recently bought one. Do you own the American DJ Nucleus LED High-energy TRI Color LED Centerpiece? Why not write a review based on your experience with it. 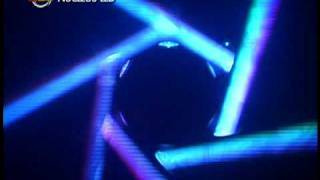 Seen a video for American DJ Nucleus LED High-energy TRI Color LED Centerpiece online or have you own video? 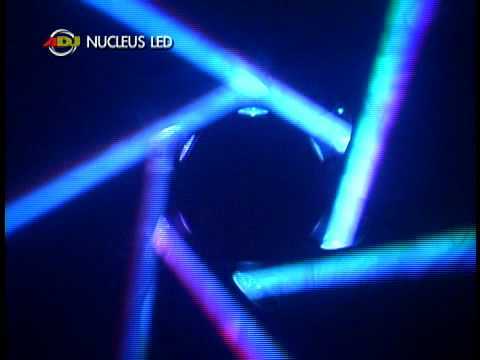 Check out American DJ Nucleus LED High-energy TRI Color LED Centerpiece on DJkit.com!